As promised, I will be a doing a full review of the game engine in its current state. This blog is dedicated to the renderer in my game engine. I will provide you with a high-level overview, how the renderer came about, and some interesting implementation details. Like every other game, Monter’s rendering pipeline is not just a simple draw call. It involves precomputing textures such as shadow maps and ambient occlusion textures to help enrich the visual scene when the actual rendering starts. It also has a post-processing stack which helps smooth out the jagged edges and emulates color bleeding from bright surfaces. Each pass, except shadow mapping, will be discussed in detail in the following sections. This pass has already been covered by my first blog, so I won’t be explaining it in detail. All it does is generate the depth texture for us to use when we try to compute the shaded points when the actual scene rendering happens. Screen-space ambient occlusion is a method that approximates global illumination at a small scale. For each point on the screen, an AO (ambient occlusion) factor is computed based on its surrounding geometries. These AO values are stored in a texture which is used to approximate how much ambient light each point receives when it gets phong-shaded. 1. Treat the position texture map as a function of two real numbers, x and y, outputting a 3d position. Partial derivatives of this function relative to the x and y axis of each point on the screen are computed and used to find the normals of each position which are the normalized cross products of these derivatives. These come in handy when we compute the AO factor. 2. We now want to distribute a bunch of random sample points within the hemisphere above that point oriented along the normal we just calculated. Then we project each sample back into the position texture and test its own depth against the depth retrieved from the position texture. If a depth is smaller (closer to camera), that sample is not occluded, otherwise it is occluded. Of course, the requirement for this to work is to sample positions in view-space, which is why we store positions in view space during the position gather pass. To accomplish this, a certain number of random unit vectors (offsets) are generated with the aid of a 4x4 texture containing random noise tiled over the screen. Then for each offset, we compute a sample point by adding the original point with that offset. By doing that, we generate a bunch of random samples within the sphere with the point as the center. However, that is not enough; we want all those samples to lie inside the hemisphere. What we can do is, for each offset that makes an angle more than 90 degrees with the normal (easily testable with a dot product) we could just negate it. That will ensure all of our offsets to be within the hemisphere of the point along its normal. The occlusion test of each sample is just a simple depth test. After all this, you sum up all the samples that are not occluded and you are left with the AO factor you are looking for. However, in my case, I’m not finished yet. I used a 4x4 random vector tiled texture to generate random noise. As a result, there is a banding noise caused by the 4x4 pattern repetition. So all I have to do is a 4x4 blur on the AO texture to remove that artifact. If you are looking into implementing this feature yourself, I highly recommend chapman’s SSAO blog, as it covers a lot of details that I didn’t mention. The original SSAO method presented in chapman’s blog produces good results but it’s too slow. In Monter’s renderer, the entire AO pass is done on a low resolution texture, which are upsampled when needed for rendering. This speeds up the AO pass by at least 4 times but the result is often blurry and contains halo artifact. This can be compensated for by using bilateral blur and bilateral upsampling. Despite how much realism it adds to the scene, it’s meant to be a subtle effect and shouldn’t be exaggerated in a game. It’s no where near physically accurate in most cases and is quite appalling to look at when not used correctly. Here’s a tweet showing how over-using SSAO totally ruins the look of your game. So don’t worship SSAO. For a diffuse surface, the surface is really rough and light will not reflect along the normal of the point it hits. Rather, it will scatter randomly and the direction of light exitance could be any of the unit vectors that make up the hemisphere above the point (all of equal probability). Therefore, we can think of light exitance to be completely independent from the view direction since you probably get an equal amount of light no matter where you look at the surface. To calculate the light attenuation on a surface, the angle between the surface normal and the incoming direction of light is the key. Imagine a stream of photons hitting a surface head-on. The direction of that stream of photons is the negation of surface’s normal. Now imagine they make an angle of 45 degrees. The same amount of photons is hitting the surface per second but the surface area that gets hit by the photons increases, therefore the photons-hit-per-area i.e. the photon density on the surface decreases. If you graph it out, it’s clear that the attenuation of the light intensity is the cosine of the angle between the negation of incoming light direction and the surface normal. This is called the lambert shading model and it’s one of the most common reflection equation used in games. In Monter, there are two types of light: directional light and point light. It’s important to point out that point light does not only attenuate based on the incident angle. It also attenuates based on distance. Don’t get me wrong, photons don’t lose energy as they travel unless they collide with other substances such as dust or fog but we are not trying to simulate them here. It attenuates purely because it radiates as an expanding sphere. The further the surface is, the less dense the photon stream that hit the surface will be. Due to the property of the surface of a sphere, the light intensity falls off as an inverse squared equation. In order to have complete control over how each light should behave, I don’t just use the inverse square equation to calculate distance attenuation. As you will see in a bit, there’s other parameters I can tweak to change the lighting. Now we know the relationship between incoming light and light exitance, but we also need the light to interact with surface’s material to show any color in the screen. One thing to realize is that surfaces do not have color; they just absorb a certain color from the light and reflect the rest (not actually what’s happening but it’s a good enough substitution model). So I simply multiply the light exitance with color of the surface. Now, remember I calculated the AO factor only for ambient light so it should be multiplied to the ambient term only. But from experimenting with the rendering, I decided to also multiply it with the diffuse term for better visual effect. By default, when you write color values to a texture or default framebuffer, they are clamped between [0, 1]. This greatly limits how we can design our scenes; if we want to have an area with a lot of light, then it’s going to be all white because of this limitation. One way to work around this limitation is to render the scene into an HDR texture then map it back to the [0, 1] range. This process is called tone mapping. Pretty simple and gets the job done, but not done well. If I have time, I’d much prefer using an actual tone mapping algorithm that does it properly. But for the time being, I will just have to bear with reinhard tone mapping. Since we aren’t limited by the range of color, we can do something fancy like a bloom effect. It’s pretty simple; when we output the scene texture, we write to two HDR buffers: one scene buffer and if the color is above a certain threshold, a second HDR buffer. After that, we do a gaussian blur on the second HDR texture that only contains bright pixels. Then we do an add operation between these HDR textures and tone map the final output. Like SSAO, bloom is also too slow if we do it at the same resolution of default frame buffer. So we repeat what we did to speed up SSAO; we downsample to a low resolution texture and upsample it when we do the addition. FXAA is a post-processing effect that blurs jagged edges. While it smoothes out the jagged edges, it suffers from temporal aliasing so it’s best combined with some temporal anti-aliasing effect. If you’re interested in more detail, you should head over to this paper. I still have a whole lot to talk about but that will make this blog way too long so I’ll save it for the next one, stay tuned. 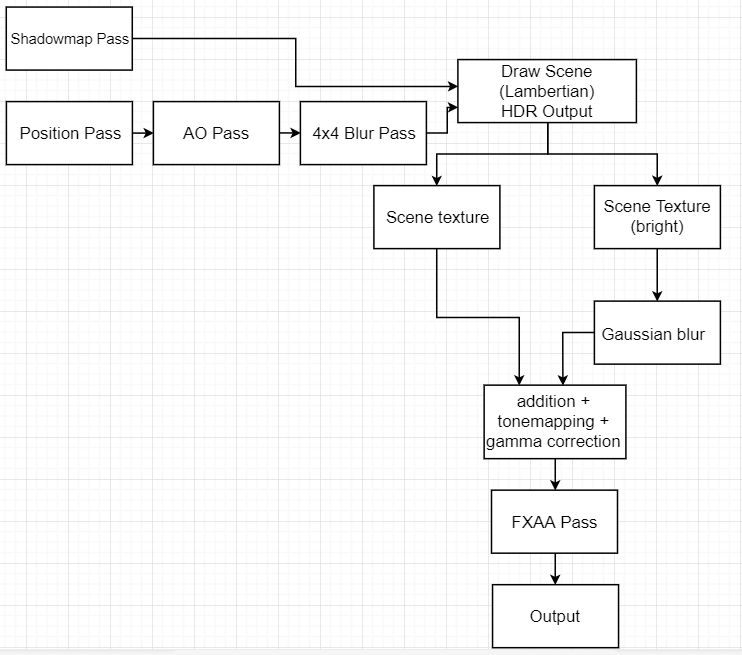 John Hable wrote a good artical on filmic tonemapping with piecewise power curves, if you're interested. Timothy Lottes also made an interesting slide presentation that also shows proper crosstalk/desaturation in the highlights. Called: Advanced Techniques and Optimization of HDR. VDR Color Pipelines. What are the *performance* costs of running SSAO? How many % of the GPU time? What are the *minimum* GPU requirements for running SSAO (even when at the 1/4 resolution) at a good framerate? What about MSAA over FXAA? I have no intuitive idea about the GPU costs of any of these algorithms. Or what effect do any of them have on hardware requirements. With CPUs it's simple to "eyeball" the performance effects and system requirements. And using steam hardware survey it's easy to tell that SSE2 covers everything. And it's reasonable to expect SSE3 in a modern game. 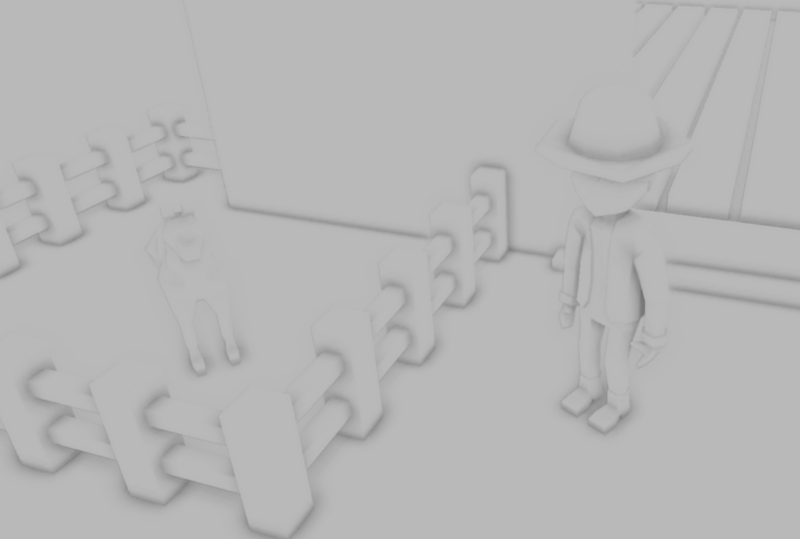 It's not that simple, SSAO requires that the fragment shader gets a look at neighbouring pixels. This little bit alone means a massive cost because the required intermediate rendering result needs to be flushed out to memory before you can actually do the SSAO (a latency and vram-bandwidth hit mostly). However if you already have a pass that need neighbouring pixels (like a blur or bloom) then it's probably not as bad to add it. SSAO is the most expensive pass hands down. It takes about 33% of the GPU time, but do take that number with a grain of salt. I don't have a good GPU profiler like Nsight because my current dev machine is very crappy (Intel HD Graphics card), so what I do is to force opengl to synchronize and finish the previous operations by calling glFinish() after each pass, then sample the amount of time each pass takes. Like ratchetfreak said, SSAO is particularly expensive not only because of its computations, but also because it does a large number of texel fetches per fragment in the fragment shader. The texel fetches done during SSAO is especially costly because it doesn't just sample neighbor texels all the time. If your SSAO hemisphere above the surface is large, that means samples are distributed over a large area, therefore takes a larger screen space. Then you might be sampling texels far away from the fragment you're processing right now, especially when your camera is close to a surface. If you keep fetching texels from parts of the memory that are not in the cache, then that's a big performance hit. Doing SSAO in a lower resolution texture does not only cut down the number of fragments you have to process, it also make the texels closer together when you fetch them, and that can mitigate cache miss. I'm not sure how to answer that because I lack that kind of knowledge about GPUs or what kind of GPUs there are, which is also why I'm telling you why SSAO is slow so you can be the judge of that :). Compared to FXAA, MSAA is just really expensive to run on hardware that has a low memory bandwidth or integrated graphics cards that share the same memory with RAM. If we do x4 MSAA, then all multisampled buffers are 4 times as a non-multisampled buffer, and processing them is slow for the memory-constrained hardware. But if your hardware doesn't have such constraints, then MSAA is perfectly fine. That being said, Monter DOES support MSAA, I just think it's such a popular feature it's not worth mentioning it here :). MSAA beats the crap out of FXAA. You might see blog posts that say something like "MSAA is obsolete because of post processing anti-aliasing", and that's completely untrue. First, there's no such thing as post-process anti-aliasing because we lose all the information already when we reach the post-processing stage. Secondly, post-processing techniques result in blurry images and are accompanied with temporal aliasing. MSAA is ACTUALLY doing anti-aliasing so it handles both jagged edges and temporal aliasing. In conclusion, if you can do MSAA, always do it. The image it produces is a lot more crisp than FXAA'ed images and doesn't have temporal aliasing problems. Oops, forgot to mention stuff like TXAA exists. The temporal aliasing problem of FXAA can be overcome by combining it with TXAA, but the result is still going to be much blurrier than what MSAA produces. I get that SSAO is *expensive*, it's not clear though which class of GPUs gets eliminated by using it. The main thing which draws me to SSAO is how much it simplifies everything. Right now I'm using vertex-color baked ambient occlusion - and the amount of engineering effort that goes into it is staggering. And on top of it - it only works for static geometry. And then baking AO into vertex-colors produces artifacts - so then at one point i was clipping overlapping polys to reduce that. And the kicker is - you don't have to do ANY of this if you use SSAO, it's so simple and works for "everything". The beauty of SSAO + shadowmaps is that visually - for outdoor scenes - it gets you 80% of the way robustly. No big-extra work on CPU, no extra engineering effort. It's like how introduction of Array Textures, depending on what you're making, allows you to throw away all the atlas packing code and the complexity coming from that. Same with when hardware became fast enough to do shadowmaps effortlessly. Or how deferred shading makes most things ridiculously simple to do (comparatively speaking). Projecting decals on meshes, then clipping, all that magic? With deferred screen space decals - TRIVIAL. I totally agree with that. SSAO's elegance is in its simplicity. One thing I want to clarify, though, is that the acronym SSAO itself is really ambiguous. When you mention SSAO, are you referring to what Crytek did in Crysis? After SSAO's initial appearance there are many other different versions of SSAO being invented. If you really care about performance, then I suggest this paper. It covers a lot of design decisions made just to run fast on certain architectures. And as far as what classes of GPUs gets eliminated, as I have said in my previous reply, I don't have the experience to answer that :( Sorry.